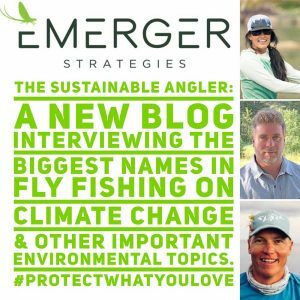 Emerger Strategies has announced a new blog series focused on climate change and other environmental issues. The first three “Sustainable Anglers” to be interviewed are: Hilary Hutcheson, Jako Lucas and Todd Tanner with more to come! The first Sustainable Angler will be published next week at www.emergerstrategies.com. If you are Sustainable Angler and would like to be interviewed, please drop Rick a line at: [email protected].